There are some people who don’t like leftovers. That may even be you. It is sometimes me: as I am not a teen-aged boy I don’t understand the appeal of leftover pizza. But leftovers make sense. Make enough at one meal to do for another: whether chilled and eaten the next day, or wrapped, labelled and tucked in the freezer, never to be seen again to be eaten later. I do fight my irrational inner distaste of leftovers, tucking into leftover stew or curry (which admittedly always taste better the next day) and forking through salads made from leftover grains with added bits and bobs. All very worthy, time-sparing and cost-conscious. But, hmm, how do I put it? A bit dull? Yes, a bit dull, at least sometimes. I think I might not be alone in this. That’s where this recipe comes in. But first a confession of sorts. A few months ago I was so proud of myself. Properly chuffed. I will get to the point in a sec, but a little preamble first. My daughter and her friends love to get the traditional fried arancini from a local Italian cafe. Being slim girls, with enviably high metabolisms, this coterie can get away with a bit of fried food without risk to waist line and arteries. But as a former skinny minny I know how this can change. Pretty much as soon as I hit 38 I found I needed to make adjustments to long-held eating habits and tweak more than a few beloved recipes. Like a lot of people I love melanzane (eggplant) parmigiana, but found that it did not love me. Hence my lower fat, lower carbohydrate version, which I even serve to friends and family still in possession of a discernible waist. Most other recipes can also be similarly de-fatted, carb-converted or fibre-enhanced to make them healthier, without compromising taste or enjoyment. You can even make lower fat tiramisu by swapping marscapone for ricotta or even Quark. But arancini I thought was beyond tweaking. 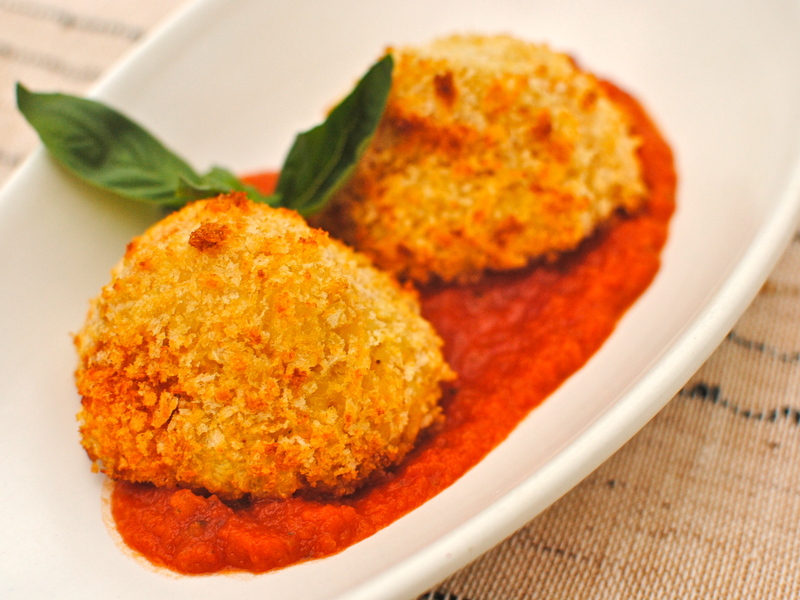 It is what it is, crunchy fried risotto balls stuffed with an oozing filling. Served mainly as appetisers in Italian restaurants these tennis ball-sized morsels are extremely tasty when done correctly, but never in a month of Sundays could they be contemplated by those minded to watch their weight, ie, most of us over 40. Until now. Or so I thought. Once again, I have discovered there is precious little that is completely original in the world of food. For about two days I lived in ignorant bliss, but after an online noodle about looking at ‘ normal’ arancini recipes I did in fact discover a few folk who had beaten me to it. By a few years too, in the case of a brown rice version from Food.com. But mine is a bit different and with varying options for how to get the essential crunch. My slender of waist 16-year old, sweaty and hungry from playing squash with her Dad, gave it the double thumbs up. And Mr A – also trim, and equally sweaty – gave his own signature exclamatory-interrogative “oh, what! ?” which translates roughly as “this is amazing. I hope you have enough for seconds.” They went as far as to say that they prefer these to the fried version, so I felt I had to share it, despite the lack of true originality. So, my lesson for myself has been that leftovers don’t have to be boring. They just need a reincarnation in the form of something extra special. And if that something special can also be a makeover of sorts, all the better. I would urge you to look at that filled plastic container, languishing unloved and ignored in a new light. Who knows, you might come up with something original too. At least until you log on. I am linking this up to Tasty Tuesday, Slightly Indulgent Tuesdays, Food ‘n Flix and Fat Tuesday (which is a misnomer, of course). Leftover risotto chilling in the fridge? Leftover marinara lurking in the deep freeze? Give them – and your family – the five star treatment with these fun to make baked risotto balls. Crunchy on the outside with a soft, melting inside, all these Italian arancini need is a crispy salad and you are good to go. Don’t delay, stuff and roll today! First of all, if you don’t have leftover risotto use the cheat’s risotto recipe at the end of the arancini recipe. It will get your risotto the right texture for the arancini without having to faff with an overnight hardening up in the fridge. This is a little drier than normal risotto, but if you are using leftover risotto its overnight spell in the cold will render it the right consistency, unless you made it very wet. In any case, mixing in an egg helps bring it together. Take your cooled risotto and, with your hands, mix it with one egg and the lemon zest, squidging it a little, and pop it in the fridge for an hour. This sounds a bit of a pest but it will keep you from cursing my name while you make this up. Half an hour might just be okay. Don’t quote me though. Now is the fun part. Get a bowl/plate each for the sauce, the last egg, mozzarella cubes and breadcrumbs. Also, to keep your hands from sticking to the rice, have a little fingerbowl on standby as well. Take a palmful of risotto in one hand, roll it and, with the other hand, flatten it a little, making a well for the filling. Now put a tablespoon of sauce into the indent, push in a cube of cheese and top with a basil leaf. With a wet spoon take a smaller (about half) amount of rice and smooth it on the top of the filled bit. Sounds a bit tricky but it isn’t. What is tricky is the way I initially tried to do it, all in a one-er, attempting to encapsulate the little blighter without additional rice – squidge-city. The sauce just pushed out. Which is fine, but not so pretty. 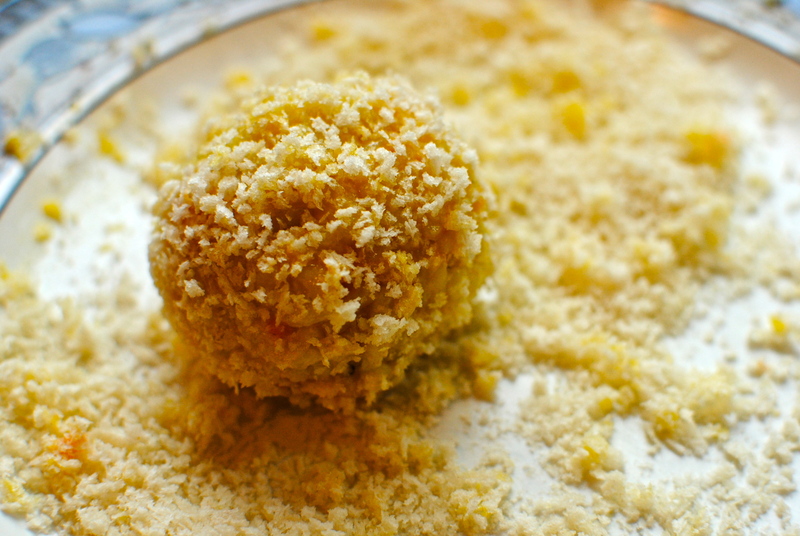 Once fully covered roll it in a ball, dip in the egg and roll in the crumbs. I then shaped it into a bit of an awkward pyramid, but you can keep it as a ball. Carry on until you finish the rice, popping each ball/awkward pyramid on a baking tray that you have slicked with 1 teaspoon of oil per tray (I used 2 trays), or sprayed with oil spray. Now this is where we may diverge. I carefully drizzled each ball with a thin needle of oil, a token amount really. I’m not sure how much was on each, but probably less than a quarter of a teaspoon – not much. You might want to go super skinny and just spray them with an oil spray, or you might want to mix your crumbs with 1 tablespoon or so of olive oil before coating the balls. It’s your choice really. Whatever you do it will be a heck of a lot healthier than frying. I might try the oiling crumbs method next time, but we as a family were very pleased with the result from the drizzling. 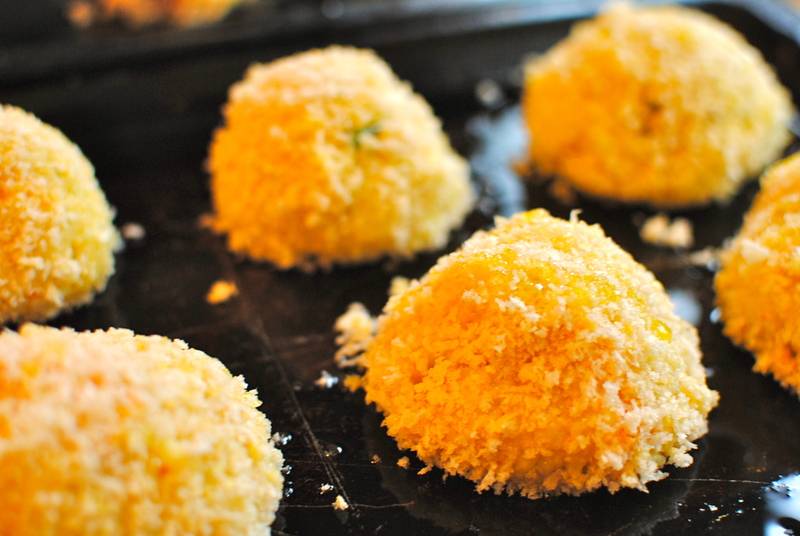 Pop the arancini in an oven heated to 200C/400F and bake for 30 minutes. 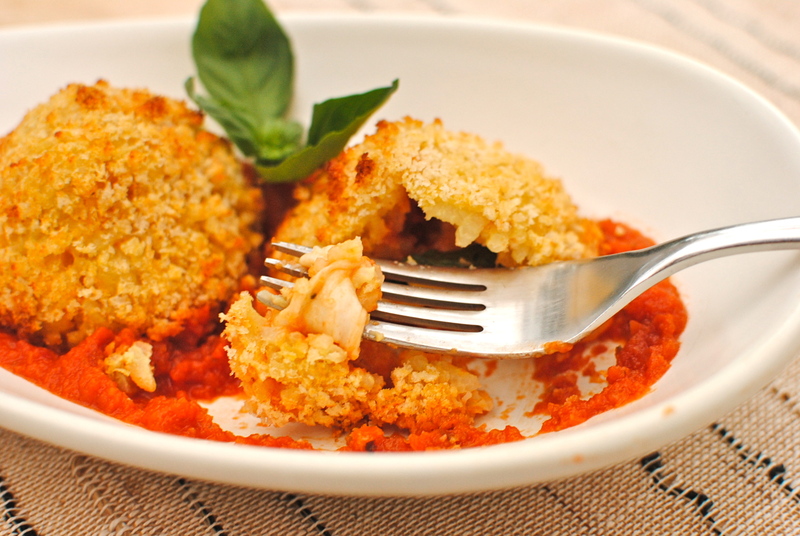 Serve with warmed marinara sauce and a crisp salad. Massive pepper grinder, optional. Makes 10-12 balls (2-3 balls per serving). You can freeze any leftover, uncooked balls and heat from frozen – adding about seven minutes to the cooking time. This can also be made as 20 appetiser sized balls, but these are a bit more fiddly to fill. Pour the stock over the rice and chopped spring onion and bring to the boil. Give it a stir, then reduce the heat and simmer with the lid on for 15 minutes. Have a peep and give another stir at 10 minutes. If at 15 minutes it still seems sloppy, give it another five minutes, then remove from the heat and pour into a shallow container to cool to room temperature. From here you add in a beaten egg and lemon zest and carry on with the arancini recipe, as above. 1 tbsp olive oil; 1 onion, diced; 2 cloves garlic, peeled and minced; 3 tbsp fresh thyme leaves or 1 tbsp dried, 1 medium carrot or ½ red pepper and 1 stalk celery – minced; 1 kg of fresh plum tomatoes, chopped OR 2 x 454 gm tins best quality chopped tomatoes (Cirio are my fav), salt to taste, sugar or honey to taste (if tomatoes are a bit bitter). I often add a tablespoon of balsamic vinegar too. Heat the oil in a medium, heavy-bottomed pan (not aluminium). Add the onion and sauté gently until onion is soft – about 5 minutes; add the garlic, thyme, carrot or pepper, and celery; continue cooking for 15 minutes, until the carrot is quite soft. Add the tomatoes with their juice and bring to the boil, stirring often. Lower the heat and simmer for at least 30 minutes, until as thick as porridge; season with salt, and maybe a pinch of sugar. Cool slightly and whiz with a hand blender.You can keep this sauce in the fridge for one week or freeze in an appropriate container for 3 months. how wonderful is this recipe!! i also BAKE my falafels instead of frying them and eggplant parmigiana… oh dear sooooo fatty but soo good. i still believe the occasional fatty “regular” version of it is just fine, there are plenty of other righ tasting italian recipes that are waist complimenting!!! I have never been a big fan of arancini as, even when i lived in rome, i happened to choose soggy ones and i am more the crunchy type of person! will definitely try your version though! amazing pics toO! I know, I too prefer baked to fried falafels but I have to make sure they aren’t too dry so I use sweet potato or beetroot in them. Do you do anything special to keep yours from drying up? If you try these arancini I guarantee they will be lovely and crunchy – no chance to get soggy because they aren’t soaked in oil. These look BEAUTIFUL! 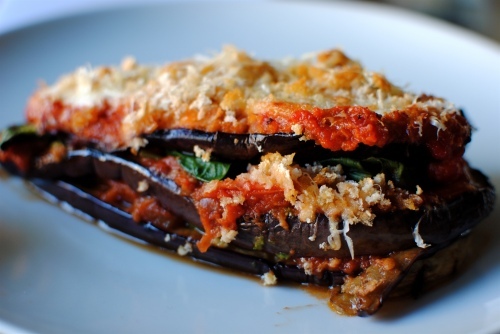 I love eggplant parm, but I’m like you – it does not agree with me at all. My heart burns for days after! The pictures do this dish a great deal of justice – I hope to try soon! Thanks so much for finding me Skylor. I’m very flattered you commented as I love your blog, everything about it. I think I found you through Heidi Swanson. These arancini balls as just as lush as the fried ones but don’t come with a health warning. Looks great and a great idea! I look upon leftovers as a creative challenge. Kelli, it’s nice to have a healthy version – I make a great Riced Ball – but not a healthy one! I will try yours. One thing we always found, that you make the rice fresh, construct the rice balls and then put them in the fridge overnight with paper or cloth towels in between. They hold up much better that way! I’m inspired by your healthy alternatives to great food! Thank you!!! Thanks Linda. Your doing the rice fresh and then making them up for next day cooking sounds a good idea if you aren’t doing as leftovers. 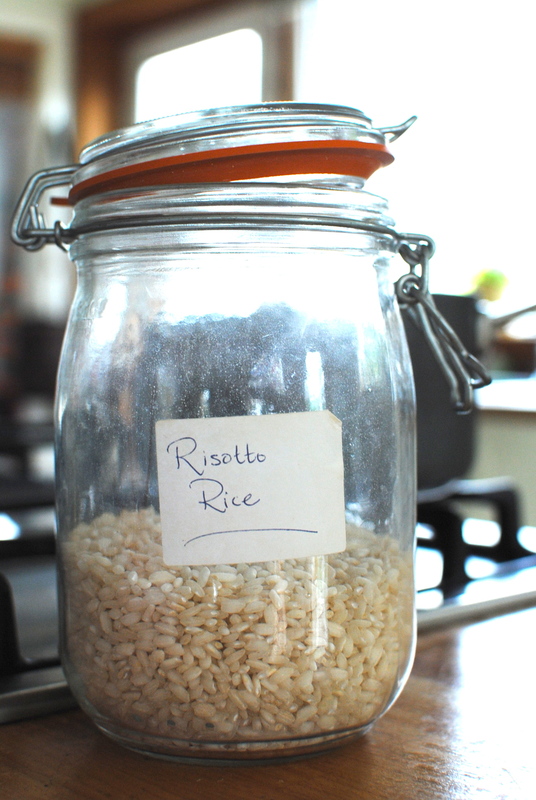 Risotto rice is amenable stuff, isn’t it? That is a fun appetizer – great job lightening it up – that was not easy! I’m a huge advocate of using leftover too — I hate wasting food! (It seriously bothers me on so many levels!) Love how you lightened up the classic recipe…they look every bit as delicious! I, too, am a Non Liker of leftovers..until THIS! It could be love! LOL! That’s very kind of you, Courtney. Thanks! I have never had these before. Can you believe it? So to heck with using leftovers. I will be making some risotto and sauce, so I can make these. I will have to think of another binder instead of egg for my vegan hubby though. Hi Jac 😀 No worries about the egg. It should be fine without, especially if you give it right good squish when mixing it with the lemon. Perhaps chilling it a little too. Thanks for stopping by. It’s funny, but in terms of blogging being international, we are practically next door neighbours. Hope to see you again soon. I’ve made risotto cakes in the past (fried, because I like to pretend that my metabolism hasn’t slowed), but never thought to stuff them. These look great, and have the advantage of not just being last night’s risotto in a different shape (which does not fool Bonnie Lee one bit). Thanks for sharing. Funny that stuffed is the only way I’ve had them, and fried (despite metabolism issues…). I’m glad they look okay for leftovers. I need to catch up with your blog tonight & learn something new! Not much new there since you last peaked in, though we have been busy in the kitchen (mostly getting a vegetarian collection ready for the app). Along the way we made a few discoveries that I plan to start writing about today. 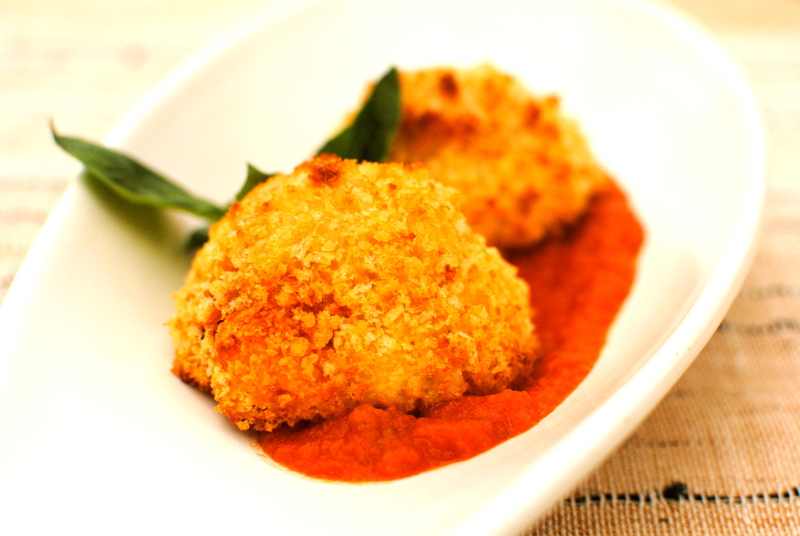 I’ve never tried arancini balls, i love risotto so these balls should be yummy too! Can I use normal rice? Thank you for your thoughtful comment. You know, I’ve never made arancini with anything other than risotto rice but I have seen recipes using other rice, including brown rice. I think as long as the egg is in to bind, and that you cill the formed balls all will be fine. Let me know if you make it Shannon. Oh these look *so good*!!! Every time I read your blog I get total food envy. These just look fabulous! Yet another one of your recipes I’m pinning to try! 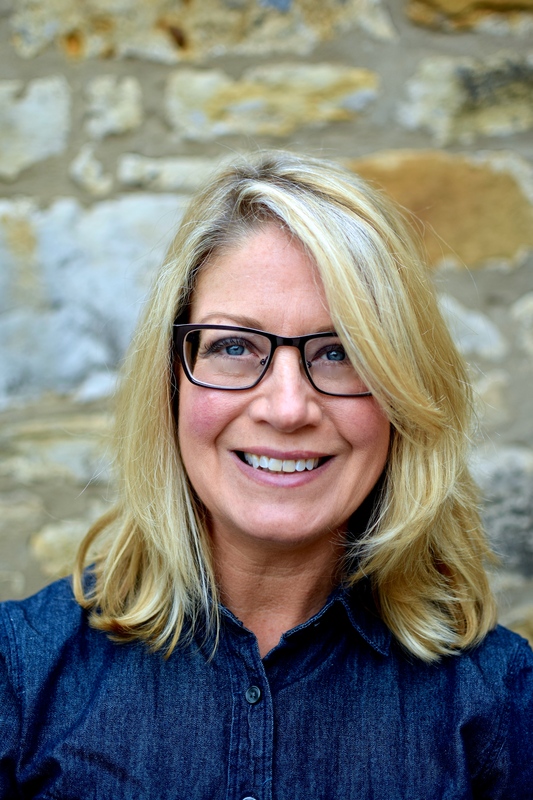 So happy to have come across your blog (and to have met you in the real world!) Thanks Kellie!